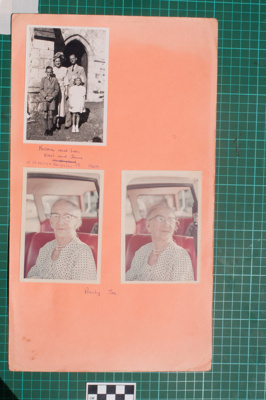 Three photographs mounted on a pale orange foolscap card with handwritten annotations in blue ink below. Described from top to bottom, left to right. Top left: A man and a woman stand with a boy and girl in front of a stone building, probably a church. The label reads: "Norman and Len | Errol and Janne | in England (crossed out) | at St Mary's Kangaroo Pt 1949 (in a second hand)". This is Norma (nee Marshall) and Len Berwick and their children Erroll and Janne. According to Ian Donaldson: "Len Berwick married Norma Marshall. Norma's sister Phylis married Ainslie Peacock (Ainslie George Peacock). Ainslie's mother was a Mitchell but I forget exactly which one (Adeline Elizabeth Mitchell). So Ainslie was Gwenda's cousin but Len and Norma were not blood related." Bottom left and right: Two views of Aunty Sa (Sarah Hogg, married Howard Gratnell Mitchell) seated in a car with red seats wearing a black and white spotted dress and a double string of pearls.